Additional considerations for working with metal panels in winter. In part one of our series on metal roofing and snow, we covered five of the most important elements to consider when preparing structures for winter weather. In this post, we’ll review four more ways to prevent unexpected, costly damage of metal panels in winter. Metal roofs absorb heat quickly and radiate it effectively. Darker panel colors can enhance this solar absorption effect, which can save you money year-round. But because UV light can pass through 3-5 inches of snow, when combined with heat loss through the roof, it becomes more difficult for snow to stay solid. To minimize the chance of ice damming, you should ensure your roof system is properly sealed and insulated. If not, ice damming may occur and the melting and re-freezing of snow throughout the day can result in icy layers that promote snow sliding—no matter the roof material or color. 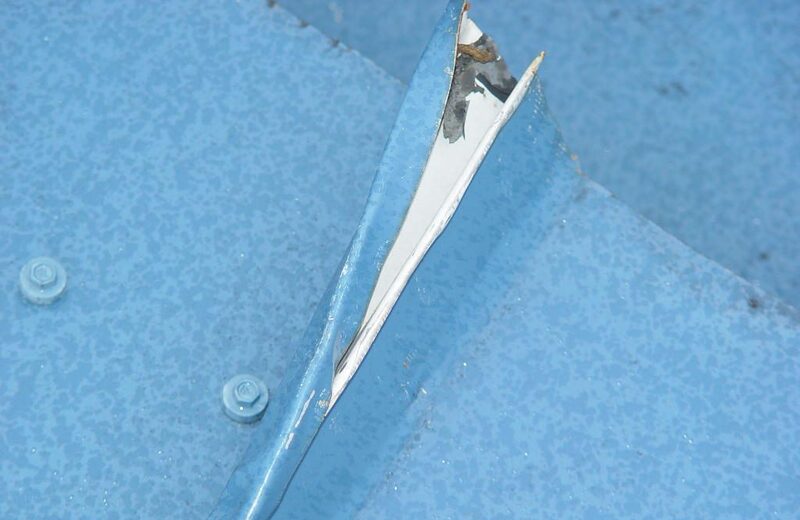 For low-sloped roofs (less than 3:12), it is especially important for panel seams to be watertight to prevent water (melted snow) from leaking into the structure. This can be problematic when snow gathers and stays on a roof. Architects, designers and specifiers, therefore, should consider using panels that have passed the ASTM 2140 water head test or FM 4471 Appendix G water test. Water-resistant underlayment should also be considered for all roof slopes. A close-up of this dormer roof illustrates how the impact of sliding ice and snow can damage panel seams. Design elements like valleys and slope changes cause snow to collect and increases your snow load. Also, when dormers extend from a large roof area and one area is significantly bigger than the other, the structure is susceptible to experiencing unbalanced sliding snow. This imbalance can actually tear open standing seams and displace panels. Also consider that drifting snow may accumulate behind HVAC units, at perimeter walls, and behind solar and photovoltaic (PV) panels. One of the best ways to prevent snow and ice issues is to regularly inspect and maintain your roof. In addition to cleaning and inspecting your roof for possible issues, properly removing standing snow and preventing ice dams is a vital part of avoiding damage to your metal panels in winter. This often requires that you get into your attic to inspect for air leaks—the leading cause of ice dams. Read more about how to properly maintain and remove snow from your roof in this blog post. If an issue is discovered, consult your roofing material manufacturer for recommendations as well as advice on warranty claims. Additionally, you can reach out to a trusted roofing professional in your area. 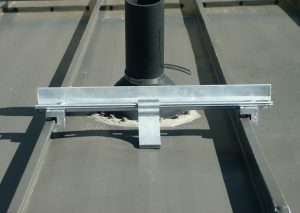 These professionals can thoroughly inspect your roof system to help you determine ways to rectify any potential issues. You’ll want to do this before damage and/or injury occurs and before you pay for sub-par or ineffective repairs. If you missed part one of this series, click here for our top five considerations. These include managing snow load and sliding snow, preventing ice dams, using retention systems and more! For more information on how metal panels fare in winter weather conditions and for advice on how to winter-proof your roof, reach out to an ABC representative today.